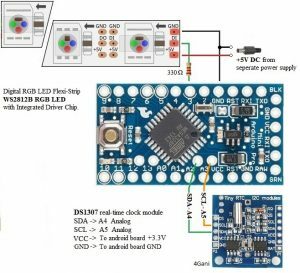 For clock I used a DS1307, which contains a real-time clock. The WS2812B LED strip is an addressable RGB LED strip and each LED includes an IC built in. This gives LEDs the possibility to communicate through one-wire interface. 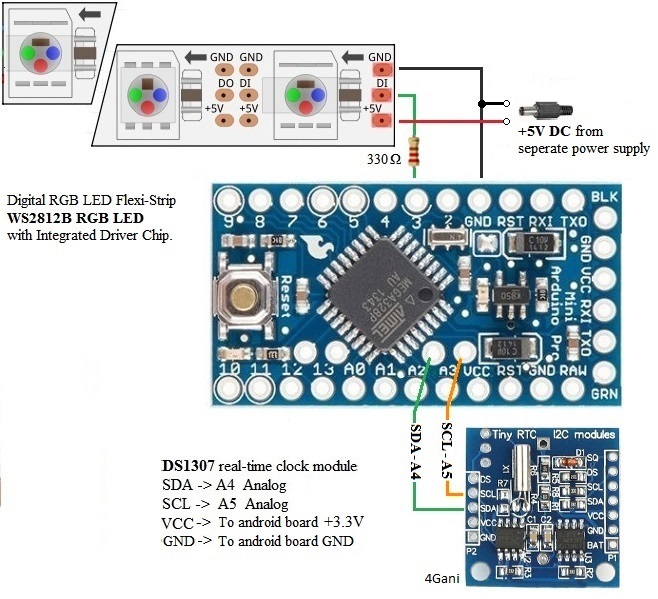 Each LED has a data in/out pin and requires 24 bits (for each color 8 bits) of data to work. Once a LED receives 24 bits data at its data-in pin, it forwards the data through its data-out pin to the next LED’s data-in pin. The LED strip should be powered by an external 5V-12V power source. by setting LED to maximal brightness, the maximum current of LED will be ca. 50mA (0,05 A x 60 LED’s = 3,0 A). To reduce noise on strip you need to add a 220 or 470 Ohm resistor between the arduino digital output pin and the strip data input pin.